Carbon Copy Cloner has long been one of our go-to applications for creating bootable clones of our Macs' startup drives. Together with Apple's Time Machine, the two apps can be the key to an effective backup strategy for almost all Mac users. So, when Bombich Software told us they were releasing Carbon Copy Cloner 4, we were a bit excited. Version 4 of CCC brings a major update to the app, with a new interface that's intuitive and easy to use, new capabilities, and improvements to features we've been using for a long time. A new single-window user interface is easier to navigate and puts all of the app's features at your fingertips. New Task Chaining feature lets you build a custom backup system by chaining various tasks together. You can now edit scheduled tasks. Email notifications get a nice improvement, with new customization options. Task history logs allow you to review backup activity. Improved Disk Center gives you quick information about the drives attached to your Mac. Clones can include an archived image of the hidden OS X Recovery partition if present on the source drive. Compatible with OS X Yosemite through OS X High Sierra. There aren't many cons, so allow us to nitpick a bit. A time estimate of tasks is missing, both before a task begins and when it's in progress, except in CCC menu bar items, which include a percentage complete figure, although still no actual time estimate. Creating reasonably accurate time estimates is a difficult thing to do in a backup app, but as long we're nitpicking, we thought we'd mention it. History logs are provided in a separate window. 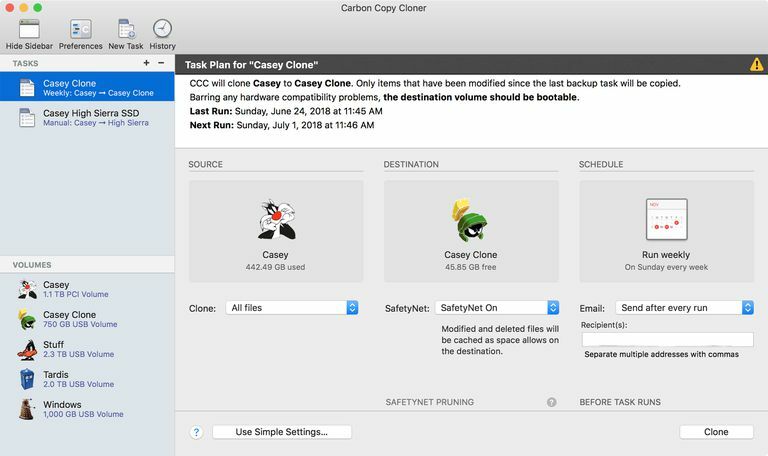 New versions of backup apps rarely cause much excitement here, but Carbon Copy Cloner has such a long history with the Mac and we were very interested in seeing what Mike Bombich had come up with in the way of new or improved features. So, we eagerly downloaded the newest version of CCC and set about testing his cloning utility. The new interface is wonderfully easy to use. You can create a clone by selecting a source, selecting a destination, and clicking the Clone button. With those three simple actions, you're off to the races, or at least to having a bootable clone. The simplicity hides quite a bit of complex actions that need to be taken to make effective clones of data, and CCC provides access to these more advanced options as well, for those of you who need or want more control over the process. Carbon Copy Cloner allows you to repeat tasks, such as cloning your startup drive using a schedule. Schedules can be as simple as repeating a task once every hour, or every week, or every month. You can also create more complex schedules that allow your Mac to be asleep or powered off. CCC will even monitor your connected volumes and run a backup if you plug in a specific drive. As mentioned above, schedules can now be edited after they're created, something earlier versions of CCC weren't able to do. The new editable schedules are great, allowing you to quickly make modifications if you realize your original schedule has a flaw that needs to be corrected. Tasks are actions you have CCC perform; for instance, cloning your startup drive is a task, backing up your home folder is a task; you get the idea. Carbon Copy Cloner 4 allows you to chain tasks together. Perhaps you want to make two clones, one to a local drive and one to a disk image located on a network drive. You can use the task chaining option to allow the two tasks to be performed with ease. Besides chaining tasks, you can also have CCC execute a shell script, before or after a task is completed. For example, you could use a shell script to ensure that no apps and associated data files are open before a task is run, a nice feature for a late-night backup. Or you could use a shell script to announce, "The clone is complete" using one of the Mac's built-in voices. We like Carbon Copy Cloner 4; this update has a lot going for it, it is ready for use for anyone upgrading from an older version of the Mac operating system to OS X Yosemite through macOS High Sierra. Additionally, the new interface makes many processes that were once a bit difficult easy for just about anyone to use, even if you're new to using this kind of app. If your upgrading beyond macOS High Sierra, Carbon Copy 5 is a better choice for the newer versions of the macOS. If you're looking to augment a Time Machine backup system or want to create your own backup and archive system, Carbon Copy Cloner deserves a look. Carbon Copy Cloner is available to download with a 30-day demo.